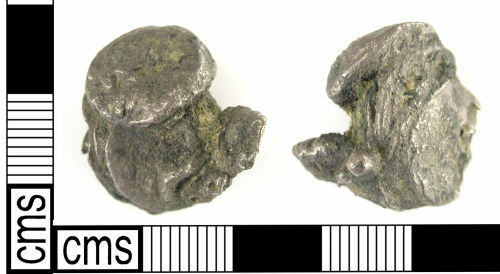 A hoard of fused silver coins, probably Medieval late 12th - 13th century. Curator's report: I have examined a fused group of coins reported found in Wandsworth, London. There are virtually no details that can be made out, but from the size of the coins and perhaps a couple of visible letters, it appears likely to me that they are late 12th or 13th century silver pennies, possibly of the Short Cross coinage (1180-1247). If this is correct, they would have a silver fineness of over 90%. The weight of the group is 21.45g, suggesting that there might be around 15 coins present. Assuming my identification is correct, the find represents a single deposit of coins of good silver and thus fulfils the criteria of Treasure according to the terms of the Act. Dimensions: approximate diameter of one of the coins: 17.53mm; weight: 21.43g.